If they've been to your website, searched for your products and services, or they're reading content relevant to what you offer, we'll help get your message in front of them today! 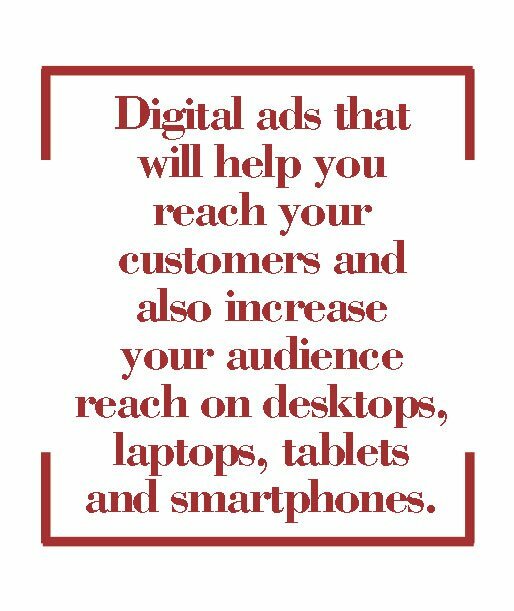 Plus all campaigns are geo-targeted, ensuring that we only share your ad with potential customers in your defined service area. Deliver your ad and leave an impression on potential customers who have visited your website, but then left. Deliver your ad to potential customers who are searching for your products and services online. Strengthen your brand and target more potential customers to search for your business online. Win the attention of consumers searching for your competitors online AND send your ad to them when they are physically visiting your competitors. Deliver your ad to potential customers within your service area who use laptops, desktops, tablets, and mobile devices. Drive more relevant traffic to your website. Targeting people based on their specific online behavior. Have visitors stay longer and view more pages on your website.